Around half a century ago the Radio Astronomy Group at TIFR, under the leadership of Prof. Govind Swarup, embarked on an ambitious project to build a radio telescope at Ooty. This 530-m-long and 30-m-wide cylindrical parabolic reflector had a unique design that allowed it to track a source in the sky with a single rotation of the telescope along the long axis of the cylinder. In these four decades, several very significant scientific discoveries were made in observational cosmology, pulsars, recombination lines and the interstellar medium as well as the inner heliosphere. 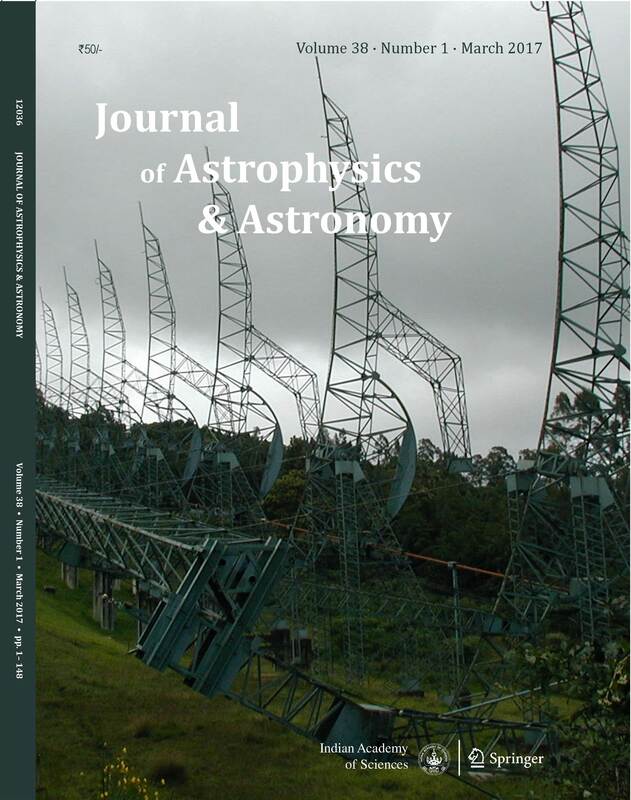 The Ooty Radio Telescope (ORT) continues to be in regular operation and is currently being used for space weather studies as well as pulsar observations. The ORT is currently undergoing a major upgrade to its receiver chain, which will result in a new system called the Ooty Wide Field Array (OWFA). The OWFA is designed to function as a 264-element interferometric array, and to provide a significantly larger instantaneous bandwidth as well as field-of-view compared to the legacy ORT receiver system. In addition to significantly enhancing the capabilities for heliospheric studies, this upgrade is also expected to open other avenues of research particularly in the newly emerging areas of 21-cm intensity mapping and studies of transient radio sources. 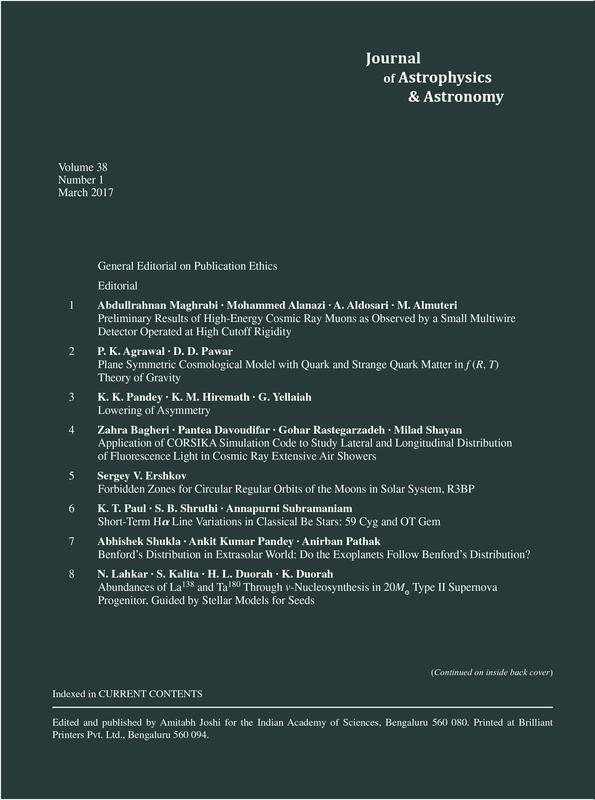 Articles in a Special Section of the March 2017 issue of the Journal of Astrophysics and Astronomy (http://www.ias.ac.in/listing/articles/joaa/038/01) present the scientific motivation, design and expected capabilities of this upcoming instrument. “I propose this evening to speak to you on a new kind of radiation or light emission from atoms and molecules.” These were the historic words of Sir Chandrasekhara Venkata Raman as he began his lecture to the South Indian Science Association in Bangalore on March 16, 1928. Following this Raman proceeded to describe a discovery of the world renowned Raman Effect which changed the course of physics and won him the Noble Prize in 1930…the first Asian and Indian to receive the most coveted prize of science. Countless men must have observed the blue color of the sea since ancient times…but it took the genius of C V Raman to decipher the natural law behind this seemingly simple phenomenon. The childlike curiosity about simple things and the perseverance to find answers is what sets scientists like Raman apart from others. And what is more, the discovery was made far away from the great centers of scientific research and by using simple equipment aboard a ship sailing in Mediterranean Sea from Europe to Kolkata. The Raman Effect explores the scattering of light when it passes through a medium. This explains that the blue color of sea which is due to the scattering of sunlight by the water molecules – a phenomenon which is called molecular diffraction. When light falls on a liquid or a solid medium, some of the beams pass through, but a small part of the light is deflected and scattered in different directions by the molecules of the medium. 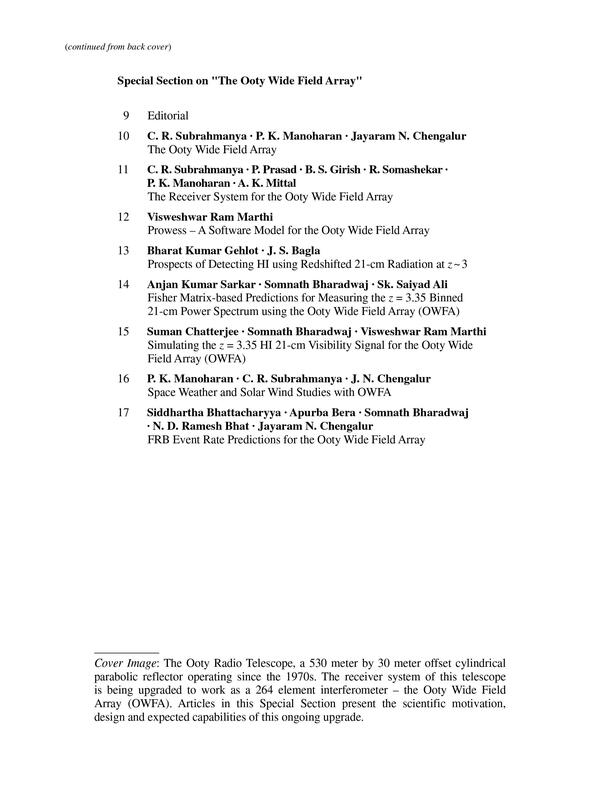 How they are deflected and scattered depends on the properties of the molecules: Raman demonstrated that the wavelength of the scattered light is different from the wavelength of the original incident beam. This change in wavelength of the light beam on deflection by a medium is known as the Raman Effect. Put simply, by measuring the change in wavelength, one can determine the properties of the medium. Identified as one of the fundamental principles of optical physics, the Raman Effect finds immense applications in today’s digitalized world as well. 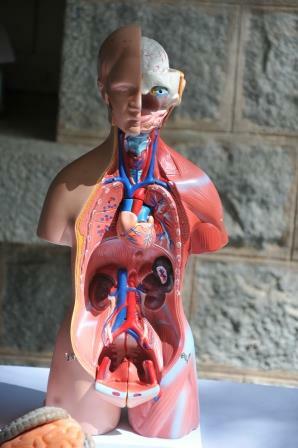 Researchers and experts working in the area of pharmaceuticals, material sciences, petroleum industry and other chemical industries regularly use a technique called modern spectrometry. This method uses the spectrum of the scattered light to understand the molecular structure and properties of the material under study. February 28th – which marks the announcement of this fundamental principle that changed the world – is now celebrated as National Science Day in India. 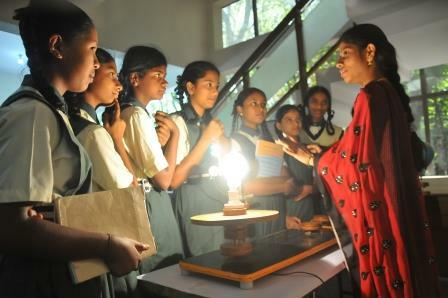 National Science Day is a countrywide science festival celebrating the need and contributions of science and technology. A day when the nation commemorates the genius of Sir C V Raman and celebrates the spirit of science through a plethora of activities ranging from seminars, debates, quiz competitions, exhibitions and lectures involving college and school students, teachers and researchers. Organized by the National Council for Science & Technology Communication Programmes, activities of this year focus on “Science and Technology for Specially Abled Persons”. When India has achieved self-sufficiency in Green Revolution and Space technology, it is time to look inwards and address the needs of the specially abled. After all, tapping their potentials is integral to the overall development and progress of a civil society. 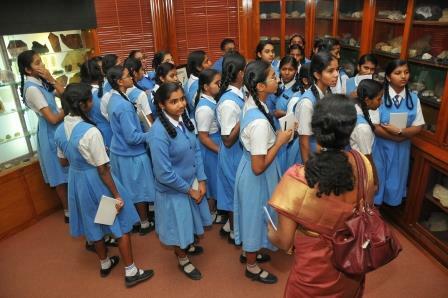 The Indian Academy of Sciences every year looks forward to the National Science Day – a day that commemorates the scientific contributions of its Founder, a day to thank the entire scientific fraternity for all their contributions, and a day to introspect all that the Academy has been doing and aims to do, towards the promotion of science and scientific temper. 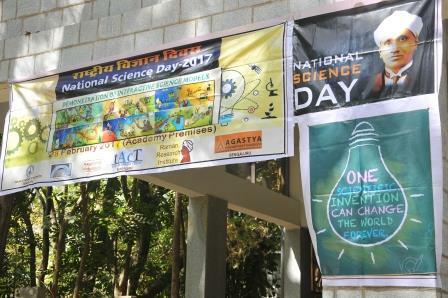 While various research institutes and colleges celebrate the national science day in their own unique ways across the nation, the Indian Academy of Sciences hosts an exclusive National Science Day event for students. 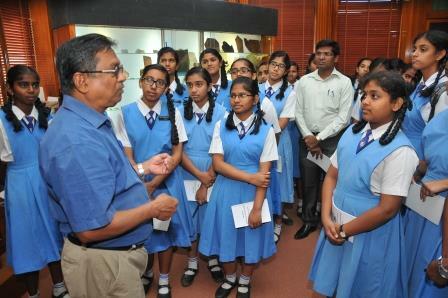 This year, school students from various parts of Bangalore visited to renowned Sir C V Raman Museum located in the Raman Research Institute. The museum houses Raman’s prized collection of gems, crystals, minerals, and rock specimens from all over the world. Worthy of special mention is the dark room of the museum where rock samples kept under UV light exhibit the phenomenon of ‘fluorescence’ – a rare sight which never fails to extract gasps of surprise and excitement from onlookers!!! Needless to say, curious students took multiple turns to see the wonder! Raman was a strong believer of learning from experimenting and observing. Bringing the same spirit of experimentation and observation to the students was the ‘Hands-on Session’, by the Agasthya Foundation. The session focused on ingeniously designed yet simple set-ups and experiments to learn the natural principles that govern everyday life, such as friction, energy conversion, etc. The occasion also saw the screening of the inspiring documentary on Raman’s life, and a drone flying session!!!! While 2017 has dawned with new promises, and the world is looking eagerly towards many new technologies and novel applications of existing technologies, one much-anticipated technology is the drones. While the trend is already in motion, coming years are likely to see large-scale use of drones to deliver specialized services ranging from healthcare in remote areas and search-and-rescue operations to security and surveillance and even scientific data collection. To give students a flavor of the future, scholars from the Aerospace Engineering Department of IISc demonstrated their drone technology while describing their mechanisms and applications. What is the relation between the Sydney Cricket Stadium and soap bubbles? Well, it has nothing to do with drones; rather with energy minimization. This was demonstrated in the Science Day Talk by Shri H R Madhusudan, Jawaharlal Nehru Planetarium. It was novel information for the students (in fact, even to most of the organizers as well) that the Sydney Cricket Stadium has been modelled on soap bubbles. The talk explored the concepts of isoperimetric problems – how circles with the same perimeter of a square will have larger area, and how such shapes in nature are optimized for energy minimization. And of course the fascinating principle of same surface area, more volume was demonstrated through honeycombs!!! As the sun sets on another National Science Day, let us acknowledge the contributions of the scientific fraternity at large and understand that if applied wisely, science and technology has immense power to transform the world. Let us all strive towards leveraging this power to drive innovations that will make the world a better place to live in. Author iasblogadminPosted on March 2, 2017 Categories UncategorizedLeave a comment on Of Prisms, Soap Bubbles and Drones: National Science Day at the Academy!! !